Here's a confession for you, I never liked pears. I didn't hate them but I didn't care for them as much as I liked apples. As a kid, apples were always a better option than pears when I had to choose. And now, I can't even remember the reason for my dislike. Such is the craziness of a picky eater, a fickle minded child! My poor parents. If you're looking for something sweet and easy to prepare, to top over dishes or serve with a selection of cheeses at a party, then you should consider this pear compote. It also goes great with yogurt (pictured here) and also with sausage. A pinch of black salt (kala namak) and a hint of green cardamom flavor the fruit while it glistens in a golden coat of sweet maple syrup. Use ripe pears that have a firm texture so they don't get mushy and fall apart when cooking. Here's a good guide to pears. I used Anjou but Bosc are also a good choice. Don't stir the pears too much while they cook. This allows the water to evaporate but also allows the maple syrup to coat the fruit evenly. I tend to leave the cardamom pods in the compote but you can discard the green shell after the fruit is cooked. Serve this compote as an accompaniment to a cheese platter, over your breakfast oatmeal bowl or yogurt. There's a lot you can do with it. However, do warm it up a little, if you end up refrigerating it. Ghee solidifies as the temperature drops and warming it a little will liquefy it. Just stir it up before use. 1. Core and peel the pears. Dice them into 1/2 inch cubes and keep aside. 2. Add the ghee to a medium-size thick bottomed saucepan and heat on medium-high. Lightly crush the green cardamom pods and add them to the hot ghee and sauté for 10 seconds. Then add the ginger, black salt, maple syrup and water and stir for 30 seconds. 3. Add the diced pears to the ingredients in the saucepan, reduce the heat to medium-low. Stir and cover the saucepan loosely with a lid and cook for 15 minutes. Stir occasionally. The pears will be golden brown in color and most of the liquid will have evaporated. Remove the saucepan from the stove and transfer the pears to a clean dish or jar. The pear compote can be served warm or at room temperature. You can refrigerate this compote for storage, however warm it a little before serving so the ghee melts. One of the things I love exploring on this blog is using grains and flours of all sorts of kinds in my recipes. The options are endless, from wheat to kamut and from savory to sweet! 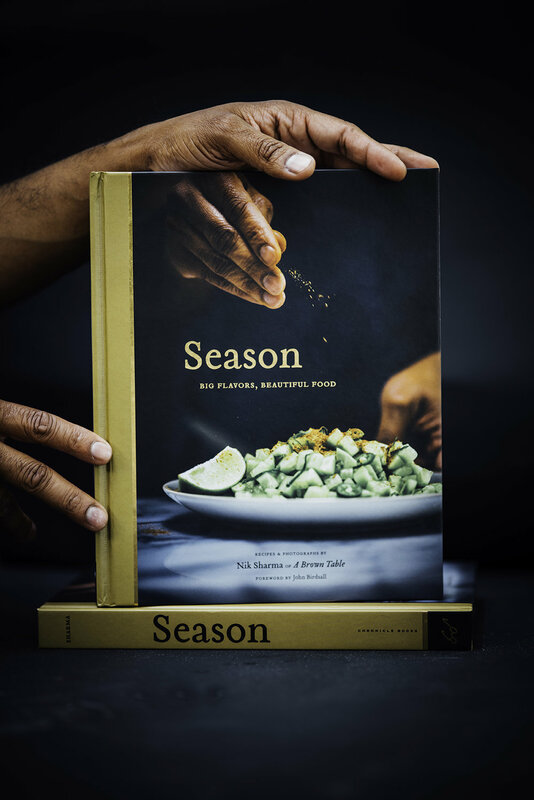 Maria Speck does just the same with her food with passion and her love for whole grains shows. Maria's latest book Simply Ancient Grains focuses on cooking whole grain is a spectacular treat> Not only does she include a variety of grains in her book but she eloquently includes them in a refreshing collection of unique dishes that are flavorful and as delicious as they sound. There are rye waffles with parmesan and rosemary, red rice shakshuka and feta, a teff polenta verde, a freekeh soup with spicy harissa, shrimp and dates, jugu cakes (an African-Indian peanut biscotti) and many more such delicious treats to cook at home and enjoy! Maria also shares several helpful tips and ideas on how to plan meals for days ahead for busy weeks that I found really useful. If you're in the San Francisco Bay Area, Maria will also be signing copies of her new book in the last week of May but she's also going to visit several other cities around the country and you can find her entire book tour schedule here. The best part, she's even cooking and serving up treats from her book at some of these spots! I selected this sweet honey flavored polenta tart to share with you from her book. It's a unique way to look at tart crusts! I find the soft texture of corn in polenta to be very comforting and how it would taste in a tart had me rather curious. So I had to try this recipe out. The flavors in this dessert are simple yet stand out elegantly. There's honey and butter glazed layer of sweet almonds that give a toffee like flavor along with with a delicious cinnamon and thyme flavored fresh plum compote that's served over the polenta tart. A little whipped cream or creme fraîche on the side and it's perfect with a glass of white wine or champagne (which is my drink of choice). I don't have a ceramic tart pan but my metal one worked fine. Just grease the pan well before baking. I used slivered almonds instead of the original sliced almonds as listed in the recipe, mostly because I ran out of them. They work great but note that the texture of the tart will be different. I used lemon thyme over regular thyme in the recipe because I grow some in a container on my terrace. It gives a little hint of citrus to the plums. I like creme fraîche over whipped cream to serve with most desserts but you can go with either. To prepare the tart before baking, I've listed two ways to do it. One involves spreading the polenta with a wet spoon while the other involves pressing it down with the flat side of a measuring cup and clingfilm (which I used). Both are easy to do. 1. To prepare the polenta, add the water, milk, honey and salt to a large heavy saucepan, heat on medium-high and bring to a bare simmer, stirring occasionally. Using a large whisk, add the polenta in a slow and steady thin stream and continue t whisk for 1 minute. Reduce the heat if the mixture starts to bubble profusely. Reduce the heat further, cover the saucepan with a lid and cook for 10 minutes. Stir vigorously with a wooden spoon every few minutes to prevent the polenta from sticking to the bottom. Remove the saucepan from the stove and let it sit, covered for 10 minutes, stirring well once or twice. 2. Butter a 10 inch tart pan and place it on a wire rack. Transfer the polenta to the pan and spread evenly to form a smooth layer. You can dip a wooden spoon in cold water and then spread the mixture. The other way to do this, is to place a large sheet of clingfilm over the polenta in the pan and using the flat base of a measuring cup spread the mixture out evenly in a layer. Set the prepared tart pan aside to firm for about 45 minutes to 1 hour. Prick the surface of the polenta with the round end of a spoon about 12 times by inserting the spoon at a 45 degree angle into the tart. Dip the spoon in cold water between each insertion to prevent sticking. This will allow even baking of the tart and prevent heaving during baking. 3. To bake the tart, place a wire rack in the center of the oven and preheat to 400F. 5. Add the butter and the remaining 2 tablespoons of honey to a medium skillet. Heat on medium and stir occasionally with a spoon until blended. Fold in the almonds and stir until the almonds are coated and the mixture starts to foam, about 1 to 2 minutes. Remove from heat and immediately spread the almonds on the surface of the polenta, using the back of the spoon. 6. Bake the prepared tart for about 20 minutes until the small bubbles appear around the edges and the almonds turn a glistening golden brown. Transfer the tart pan to a wire rack and cool for 20 minutes to allow to set before cutting. 7. To serve the tart, cut it into 8 wedges with a sharp serrated knife. Place each wedges on a dessert plate and spoon a generous amount of the prepared chilled compote with a little bit of the juices on top. Garnish each serving with a little fresh thyme leaves and if desired a little bit of a dollop of the whipped cream. For the past few week, I've been feeling a bit reminiscent. Part of me misses my old life in DC, the familiar spots and friends that I spent so much time with. After seven wonderful years in a great city, where I worked my first job out of grad school, went back to grad school, made friends that I consider family, met the love of my life, got married and had many other special moments, this would obviously be a hard change. I'm extremely thankful that we were able to make the move to California and it was definitely time for a change that we both needed. The past three months in our new home have been great, exploring new places and meeting new people but I miss the part where I could talk with my friends at any time of the day and have conversations that ranged from sensible to absolute nonsense. Not that this still doesn't happen but the three hour time difference between the two coasts makes it a little hard and requires a bit of extra planning. But, at the end of the day, I remind myself that life is full of changes and each one of those changes, planned or unplanned are important because it helps mold my way of thinking, the dual combination of the nervousness and joy of experiencing the unfamiliar that is exciting and what makes change and life fun. 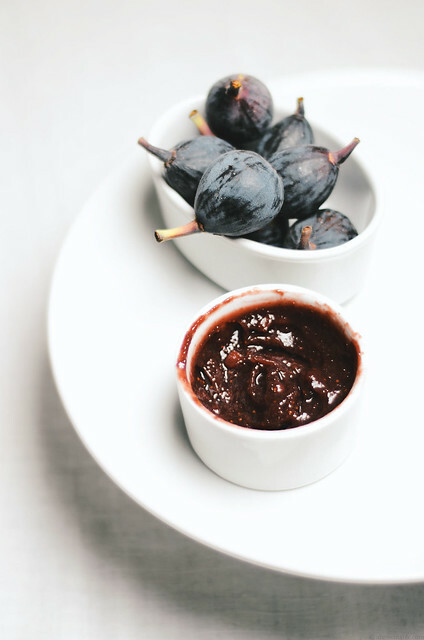 I recently made this fig compote to use a bunch of figs that I picked up at the market. As much as I love figs, there is one thing about them that annoys me the most, they grow mold rather quickly if they are too overripe. 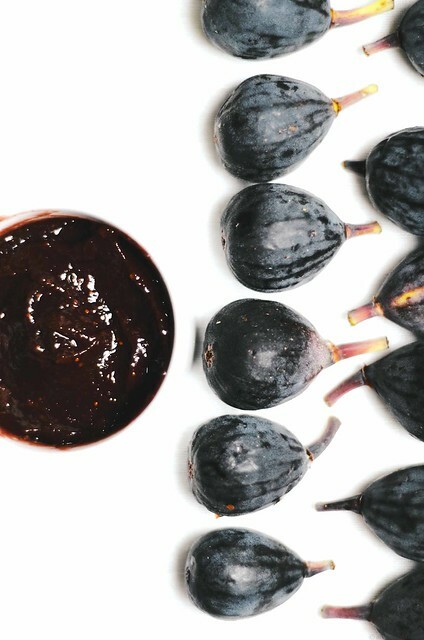 This compote was my way of immediately using up those figs and making them last for a few weeks (I hate, hate, losing figs to mold, it's really aggravating because I usually can't blame anyone else but me)! Bubbling red wine with vanilla beans is one of the most comforting fragrances that can come out of your kitchen. Fruity and floral aromas are the best when it comes to feeling relaxed. 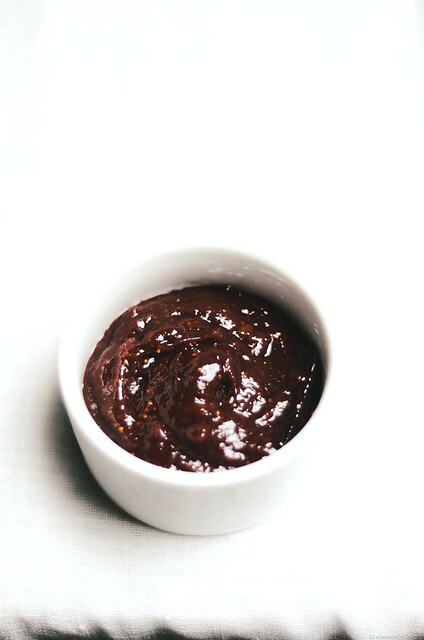 There are quite a few fall flavors in this compote, ginger and balsamic really give this a nice bump and all the flavors come together in one little jar of goodness that you can serve over cheeses or with charcuterie or pretty much anything else. Note: Since fresh figs can vary in sweetness, I recommend adding less sugar and then tasting the compote towards the end to see if you need more sugar. 1. 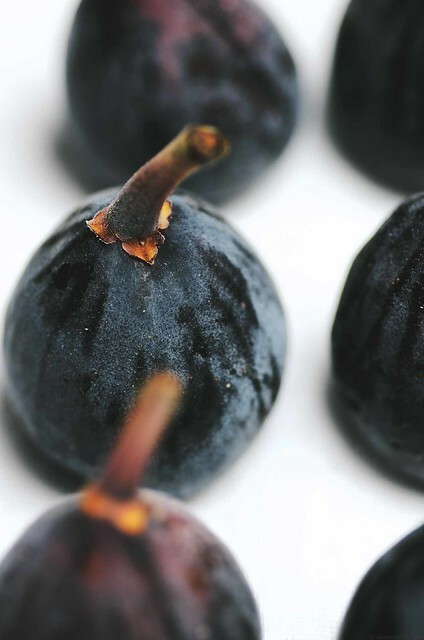 Rinse the figs under running tap water and and trim the stalks off. Slice the figs in half and place them in a medium saucepan. 2. Add the red wine and 2 tablespoons of the sugar to the figs. Bring the contents to boil on a medium-high flame, this should take about 5-6 minutes. Remove from the stove and blend with an immersion blender until smooth. 3. Scrape the seeds of the vanilla bean with a sharp knife and add the seeds and the bean along with the black pepper and ginger to the fig mixture and return to the stove. Cook on medium-low with occasionally stirring until the mixture thickens and reduces in volume to about half its original. This will take about 35-40 minutes. Once this is done, taste to see if it is sweet enough, the sweetness depends on how sweet the figs are so add extra sugar if needed. Stir in the balsamic vinegar and remove from stove. Cool and store in an airtight container.